Ridley Scott directed what surely is, along with The Thing, the quintessential alien film. Starring an oh-so-young Sigourney Weaver as Ripley, one of a motley crew of deep space miners returning to earth on the Nostramo when they are woken from hypersleep to investigate a mysterious beckon on an alien planet. Course the beckon is no SOS but a warning to steer clear. But it's too late and the crew land and end up bringing back the alien incubating inside Kane (John Hurt). After its famous birth on the dinner table, the little feller systematically begins offing the crew - Dallas (Tom Skerritt), Bret (Harry Dean Stanton), the whiny Lambert (Veronica Cartwright) and Parker (Yaphet Kotto) - as Ash (Ian Holm), the company's artificial intelligence doctor plots to save it. Alien works so perfectly thanks to the atmosphere of base fear Scott creates through his handling of the film, and the fact you never really see the vicious alien bogeyman coming. 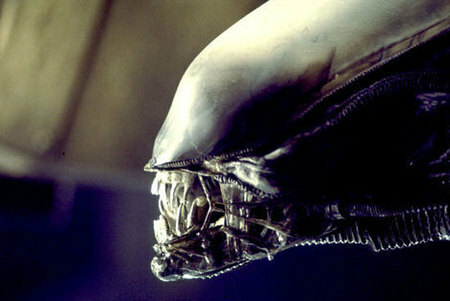 A landmark in film-making for this genre, Alien gets my rating 10 out of 10.